Its all-black design won’t be an eyesore. Cools large rooms with high ceilings (500 square feet). Runs continuously or according to 24-hour programmable timer. Some customers wish there was a middle ground between the 2 fan settings. Evaluate for damage before using. Some customers reported poor shipping and handling care. Choose between 3 modes: AC, fan, or dehumidifier. A favorite among West Coasters. Large coverage area (500 square feet) with 3 fan speeds. Won’t have to empty water tray often. Window fittings are difficult to install. Great for mid-size bedroom (125-200 square feet) with the option to increase BTU to 14k at checkout. Heat feature is also optional upgrade. Simple, all-white design. 3 modes: AC, fan, or dehumidifier. Some customer reported LED display is too bright if using overnight in bedroom. An indoor/outdoor air cooler that’s great for garages, screened-in porches, and sundecks. It’s weather-resistant with 3-sided ventilation. It has an ice compartment for creating a cool, “lakeside-like” breeze. This air cooler doesn’t work well in humid climates. No automatic shut-off and some indicator level issues reported. Another swamp cooler that performs best in hot, dry weather with less than 60% humidity. It’s the least expensive on our list. Our team loved the adjustable breeze-like sound settings: normal, natural, and sleep modes. It’s also energy-efficient. Programmable timer is limited to 7.5 hours, but it does have an auto shut-off feature. If you don’t have central air or your local ordinances prohibit window AC units, you may find yourself on the market for a portable air conditioner. We, in hot-and-humid North Carolina, feel your pain. One particularly hot summer day, our team consulted thousands of portable air conditioner reviews, tested the machines in our office, and learned how these breeze-makers actually work. We did the research for you, so your home get back to being the cool and comfortable retreat it should be. At House Method HQ, we “enjoy” our North Carolina summer as much as we can bear it. It’s hot and humid here. Even with central air in our office, our team was anxious to review portable air conditioners. 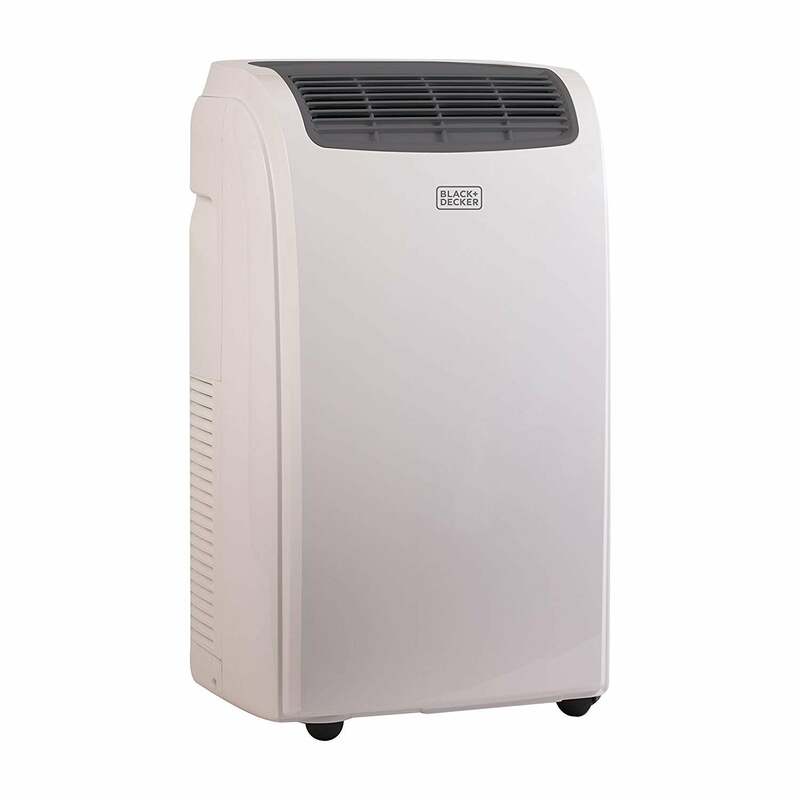 We found that portable air conditioners are best for those who live in a warm, dry climate. They’re compact, so they’re better for cooling one room at a time—not the whole house, like central AC. Although they require some window installation, they do not protrude outside of the window, which makes them cool-air candidates for renters working with strict local ordinances. We also learned that there are different types of portable air conditioners. Some are better for our high-humidity office and others are more efficient in drier regions. We’ve discussed the differences in our shopping guide below in addition to several factors to consider when shopping for a new portable air conditioner. Our team also outlined some tips that should make installation a breeze, and we answered your most burning questions. All portable air conditioners require some window installation using a flexible ventilation hose. These kits can either include one or two hoses. Single-hose portable AC units are often times cheaper and easier to install. However, because the intake and exhaust run through the same hose, these units are less effective. If you live in a moderately warm climate and only need to cool a small room, a single-hose portable air conditioner should work just fine. Dual-hose ventilation, as used with the Whynter portable air conditioner, can cool a space faster. The intake of fresh air runs through one hose and the warm exhaust flows through the other. These units are more energy-efficient than their single-hose counterparts. We included both portable air conditioners and evaporative coolers in our top five above. They’re similar in that they both cool areas, but they function differently. Portable air conditioners work in a cyclical fashion. Air enters the unit, it cools a condenser coil, and hot air is pushed outside through a ventilation hose. As a result, water is condensed and collected inside the machine. The frequency you’ll have to drain this tank depends on the machine you choose and the humidity of your home. Some, like the Whynter or Black and Decker air conditioners, have a dehumidifier setting. Evaporative coolers—also known as swamp coolers—use water evaporation to cool the air. Inside, water is pumped from a tank to a cooling pad. A fan takes in hot air from the outside and pushes it through the pad, which cools the air before it’s returned to the room or area. Evaporative coolers are more energy-efficient than air conditioners, but they’re only suitable for dry climates since the evaporation makes humidity levels rise. If you’re looking for high-efficiency, low-maintenance portable AC, look no further than Whynter. This baby brings in the breezes. It uses a dual-hose ventilation system, which means you’ll feel the difference quickly. You won’t have to drain any collected condensation either thanks to its auto-drain technology that recycles the moisture—even on continuous mode. In fact, it has a dehumidifier setting, which will collect up to 91 pints of water a day. This machine operates at 14,000 BTU, cooling a 500-square-foot space without breaking a sweat. Air conditioners are measured by how many British Thermal Units (BTU) the unit can add or remove from the air per hour. A higher BTU doesn’t necessarily mean the unit is better though. 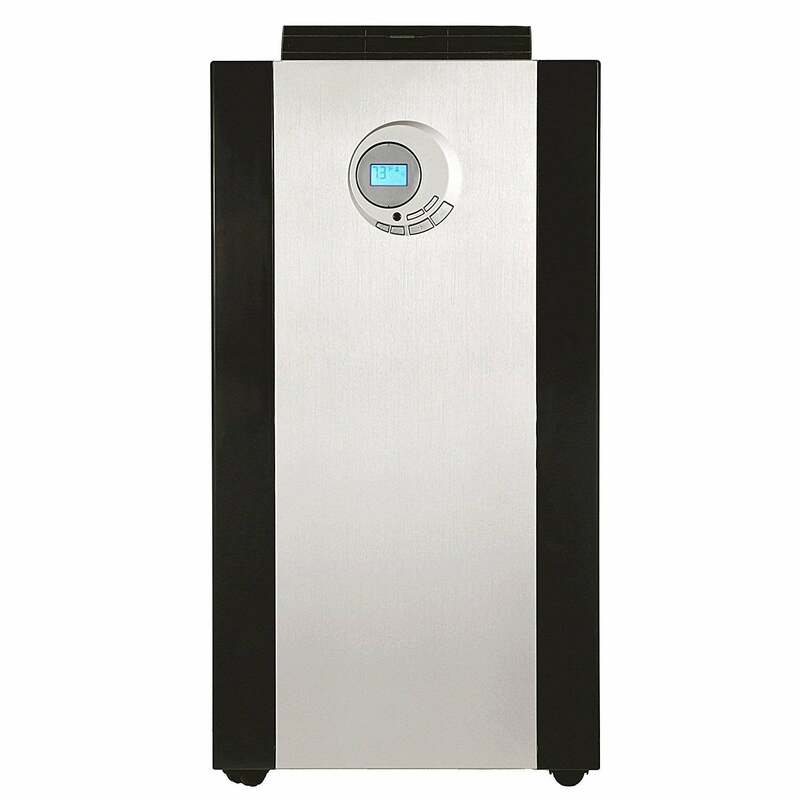 A machine with a higher BTU will cool the air faster, but it could overwork itself by cycling more frequently to maintain the desired temperature. This will consume more energy and shorten the lifespan of the machine. On the other hand, a machine with a low BTU may not be powerful enough to cool your entire room. When you’re dealing with an uncomfortably hot living space, you’ll want all the customization you can get. Look for portable air conditioners with multiple fan speeds, temperature control, and a programmable timer option. Some machines will run continuously if you want them to while others will automatically shut off after 7 hours. If you live in a particularly humid region, a portable air conditioner with a dehumidifier feature may be important to you too. Most machines come with a remote control so you can adjust the temperature from bed in the middle of the night. As mentioned above, evaporative coolers require more maintenance than portable air conditioners. You’ll have to fill the tank with water or even sometimes ice in order to keep the machine running. You’ll have to occasionally drain the collected condensation from portable air conditioners. To do so, you’ll use a water tray, which may or may not be included with your purchase. The Whynter portable air conditioner requires the least amount of maintenance since it has auto-drain technology that recycles condensation. Portable air conditioners make white noise. Unfortunately, there’s no way around it. The level of noise largely depends on the fan speed your machine is set to as well as the room size. An AC unit on high in a small bedroom is going to sound louder than a unit on low in a large living room. According to customer reviews, the evaporation coolers seem to be louder than the portable air conditioners we featured. However, the Honeywell Indoor Evaporative Air Cooler actually has a sound setting that lets you choose between three modes—normal, natural, or sleep—that are designed to mimic natural breezes. If your portable air conditioner will live in your living room or bedroom where you or your guests will have to look at it, appearance may be an important factor to consider. We love the sleekness of the all-black LG air conditioner and the all-white Black and Decker machine. These appliances will blend right in. 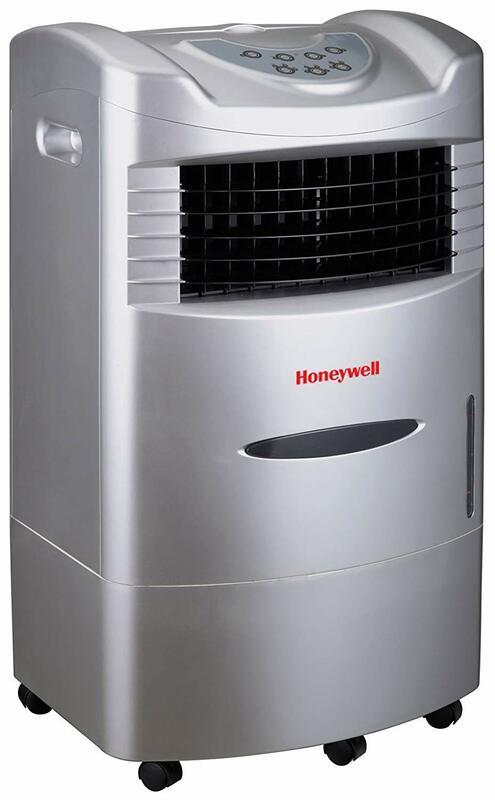 The Honeywell Outdoor Evaporative Cooler has a retro look that some love and others hate. Picture this. You live in San Francisco where 360 days of the year, you dress in layers and crack a window when it gets stuffy. But those random five days of summer can be a bummer without central air. Enter the portable air conditioner. A modern machine, like the LG, won’t cramp your Painted Ladies’ style. At 14,000 BTU, this air conditioner can keep your entire living room cool. Keep it running on continuous mode or take advantage of the 24-hour programmable timer. You can even adjust the temperature of fan speed through a remote control whilst lounging on the sofa. Portable air conditioners fairly easy to install and they take up much less space than a standard window unit. Although portable, these machines can weigh 80 pounds. These air conditioners must remain standing up because of the compressor and refrigerant inside. You’ll likely have to enlist help to lift the AC unit out of the box. Install the window panel with an adhesive seal along the inside of the frame. Pull the panel until it extends to the full width of your window. Close the window and stuff the top of the window with non-adhesive stripping. It’s important to insulate the area around the panel and open window, so cool air doesn’t escape and hot air doesn’t enter your home. Position the free-standing portable air conditioner on level ground with at least 20 inches of space all around the machine. Furniture, walls, and drapes may block air circulation and affect the efficiency of the machine. Attach the ventilation hose to the back of the machine by turning it until it clicks into place or by using a lever on the unit to lock it into place. On the other end of the hose, slide the diffuser into the window panel. Screw it into place. 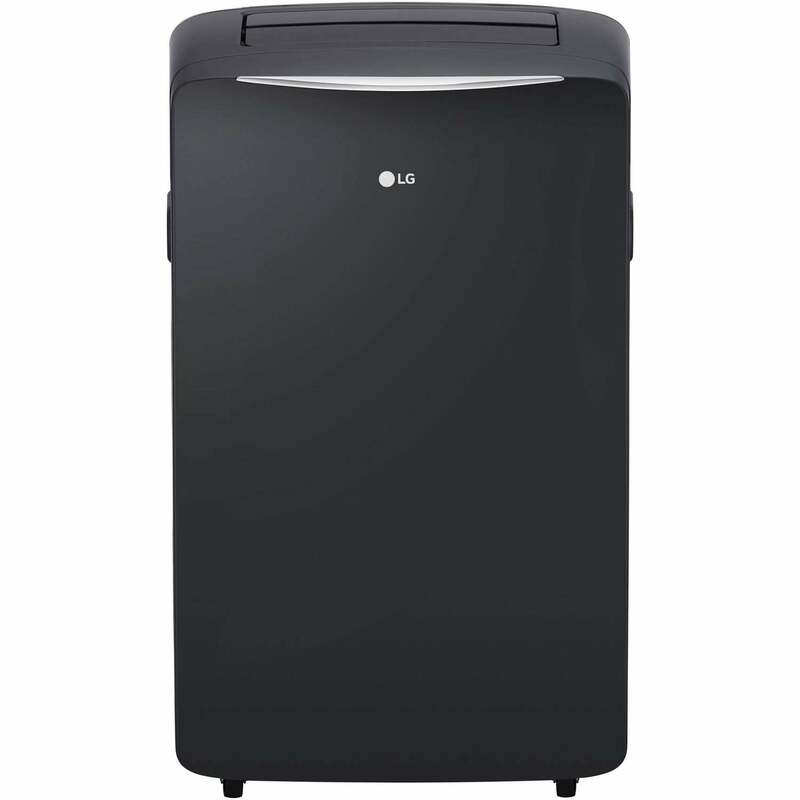 The LG is the best portable air conditioner. It’s backed by 14,000 BTU and can cool a space of 500 square feet. Control the temperature, set a 24-hour timer, or adjust fan speed via remote control from the comfort of your sofa. If you live in a particularly dry climate, you may be more interested in evaporative coolers. 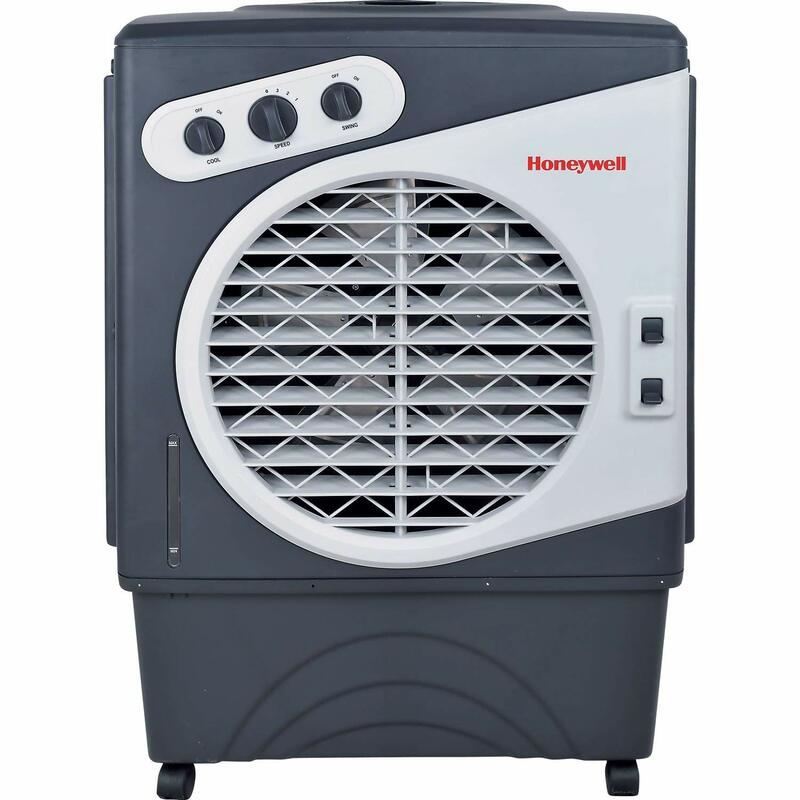 If so, we recommend the Honeywell Indoor Portable Evaporative Cooler. Our friends on the West Coast or in the Southwest will get the best run for their money with this machine. It works as a fan and a humidifier. If you’re sensitive to white noise, you switch between three sound settings. BTU stands for British Thermal Units. Air conditioners are measured by the amount of BTUs the unit can add or remove from the air per hour. The portable air conditioners we reviewed range from 10,000 BTU to 14,000 BTU. How big of a portable air conditioner do I need? Do all portable air conditioners have to be vented out a window? Yes, all portable air conditioners must be vented out a window through one or two hoses that connect from the machine to a panel within your window frame. Unlike standard window AC units, these portable machines do not protrude outside of your home and should pass all local ordinances that restrict window air conditioners. Are portable air conditioners energy-efficient? Although portable air conditioners are cheaper to run and more conservative than central AC, they are less energy-efficient than window units and evaporative coolers. If you live under strict local ordinances that prohibits window units or in a humid region, a portable AC unit may be your only option. Do portable air conditioners need to be drained? Yes, most portable air conditioners need to be drained occasionally as condensation is collected inside the machine. The Whynter portable air conditioner is an exception as it has auto-drain technology that completely recycles the condensation.